Aeroflot appears to have outrun its domestic rivals, to the point where it may even finish them off in a merger. This outcome is astonishingly different from what the authorities envisaged back in 2008, when rival Rosavia was created to give Aeroflot a run for its money. Aeroflot, Russia’s largest airline, has had more makeovers in recent years than it has Tupolev jets. It has hired employees, shed employees, and gotten rid of gas-guzzling Russian jets. The airline changed its look and the look of its flight attendants, rejecting its residual Soviet sensibility. Finally, it focused on its much-maligned safety record that, perhaps unfairly, struck fear in the heart of the most cavalier Western businessmen. But its newest incarnation is the most fascinating of all. Aeroflot appears to be swallowing up some small carriers, assets that were supposed to comprise the backbone of Aeroflot’s rival, Rosavia. The upstart was created three years ago, when aviation authorities thought a state-owned rival to Aeroflot would offer some healthy competition. The top three. Aeroflot: around 15 percent market share, UTtair: 13 percent, and Sibir: 12.5 percent. Aeroflot is Russia’s largest passenger airline. More than 11 million passengers used it in 2011. RAS revenue for the year was 114 billion rubles, with a net profit of 12 billion rubles. Brand Finance estimates Aeroflot’s brand value at 1 billion. Aeroflot is poised to expand its domestic market presence in the space of the next few months as it welcomes up to six carriers into its fold that are currently under state control. Aeroflot’s new assets are slated to include GTK Rossiya, Kavminvody, Orenburg Airlines, Vladivostokavia, Saratov Airlines, and Sakhalin Air Routes. 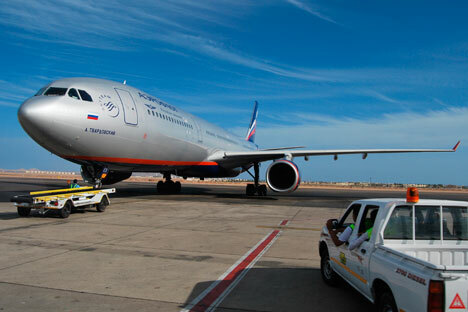 According to Aeroflot representatives, the airline has already built the new assets into its strategic development plan. “Once it acquires the state-owned assets, Aeroflot will get approximately an additional 15 percent of the Russian air transportation market. What we now estimate as Aeroflot’s 26 percent market share will exceed 40 percent once the merger is complete. As an added bonus, the airline will improve occupancy rates at its international routes, which generate the bulk of its profits,” said Andrei Rozhkov, an analyst with the investment firm IFC Metropol. Aeroflot has yet to divulge the details of the acquisition, such as whether the six carriers will be merged into it completely or will retain a degree of independence. (There has been some speculation that the deal will not include all six airlines.) Industry experts are confident however that in principle, the merger is a done deal. Moreover, according to Aviatransportnoe Obozrenie (Aviation business magazine) observer Alexei Sinitsky, the state is no less interested in the transaction than Aeroflot itself. Russian Technologies must find a buyer for the assets it has been stuck with after the Rosavia project flopped. The project to create a second Aeroflot – a state-owned airline that would compete with the national flag carrier on an equal footing internationally and domestically – was launched in the spring of 2008. It was labeled the most ambitious initiative proposed by the Russian Ministry of Transport since the early 2000s. State corporation Russian Technologies was busy scooping up distressed airlines in the crisis year 2008. As a result, it managed to accumulate assets that, if consolidated, could not only survive in this market but also crowd out its leader, Aeroflot. Although admittedly grandiose, the announced plans were entirely feasible. The AirUnion alliance together with other airlines were to form a basis for a new company called Russian Airlines that was supposed to be carrying twice as much passengers as Aeroflot by 2013. Problem is, the project didn’t live long enough to see 2013 as it hit a rough patch much earlier. Airlines in the AirUnion alliance that Russian Technologies laid its hands on were burdened with significant debts. In addition, some of those airlines weren’t even reincorporated as joint-stock companies over the last three years and continue as federal unitary enterprises to this day. The search for partners to set up a national carrier was unsuccessful too. Russian Technologies was particularly hopeful of the Government of Moscow, which controlled Atlant Soyuz at the time. The parties failed to come to an agreement however, and in early 2011 the airline (which had been renamed Moscow Airline) went out of business. Eventually, after almost three years into the project, Aeroflot made an appearance once again – although not as a Rosavia rival but as a white knight capable of saving the day. Aeroflot management was skeptical of its future competitor right from the start. Back in October 2008, its then CEO Valery Okulov called the project “a new bubble.” The government has gradually come around to share this view. Eventually, in 2009 Russia’s Minister of Transport Igor Levitin said he was in favor of merging Russian Technologies assets into Aeroflot, and in the beginning of 2010 Prime Minister Vladimir Putin officially supported the strengthening of Aeroflot with the six companies of the Rosavia holding that never materialized. The Russian market leader was to receive GTK Rossiya, Kavminvody, Orenburg Airlines, Vladivostokavia, Saratov Airlines, and Sakhalin Air Routes. Negotiations between the parties stalled once again however. Price became the stumbling block this time around. The original idea was for Russian Technologies to acquire a blocking stake in Aeroflot in exchange for the six regional carriers. Aeroflot management however was quick to announce that they valued the state’s contributions at a fraction of that price. Last fall, Aeroflot representatives stated they were ready to pay around 6 percent of their airline’s stock, before the results of an independent valuation of the assets to be acquired were made public in February 2011, pushing the price tag down to 2.5 percent. Russian Technologies categorically declined Aeroflot’s offer. According to March press reports, the lack of mutual understanding between Aeroflot and Russian Technologies has attracted other airlines vying for the legacy of the holding that was not to be. Moreover, it wasn’t just major market players that expressed interest in the beleaguered assets but also heads of various regional administrations. For instance, Sakhalin Governor Alexander Khoroshavin’s administration said it was eyeing Sakhalin Air Routes. Orenburg Airlines have also found a buyer as Transaero, one of Aeroflot’s key rivals, expressed interest. According to unofficial reports, Transaero CEO Olga Pleshakova asked Deputy Prime Minister Sergei Ivanov and Transport Minister Igor Levitin last March to consider selling the asset to her rather than to the Russian market leader. According to industry analysts, Transaero and Orenburg Airlines are now competing at a number of domestic routes, so an acquisition would allow Transaero not only to catch up with Aeroflot, but also to get rid of a regional rival. That said, none of the participants in alternative negotiations have so far officially confirmed their intentions to go after Aeroflot for the Rosavia legacy. However, all of these reports have got analysts and investors wondering once again whether the flagship carrier really needs the distressed assets in the first place. The companies’ debt burdens further detract from the appeal of any acquisition. Specialists estimate the combined debt of the six carriers at around $800 million. For this reason, specialists don’t rule out a compromise version of the merger. Aeroflot is primarily interested in Orenburg Airlines, GTK Rossiya, and Vladivostokavia. Because of that, Alexei Sinitsky points out, Aeroflot might just buy those three companies, leaving it up to Russian Technologies to continue looking for buyers for the rest of them.